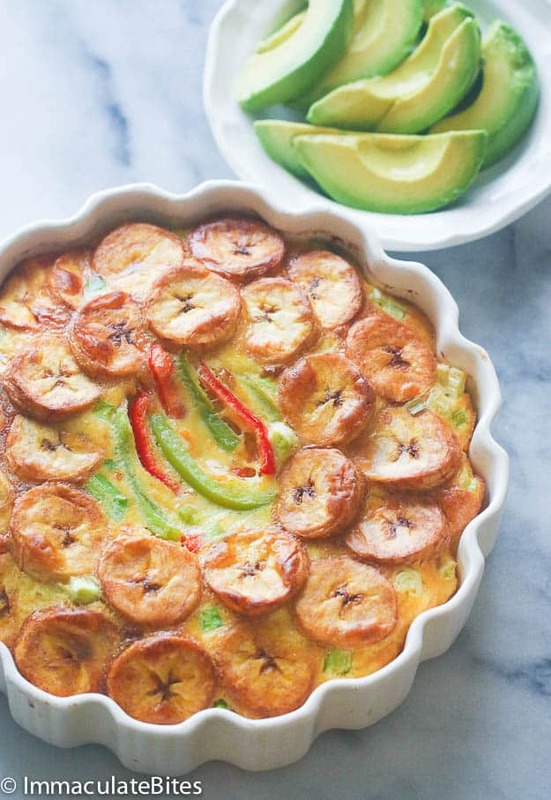 Baked Plantain Frittata aka plantain and eggs- A healthier and delicious take on fried plantains and eggs . Not a big fan of potatoes? Love to eat breakfast? In search of something different and truly tasty? 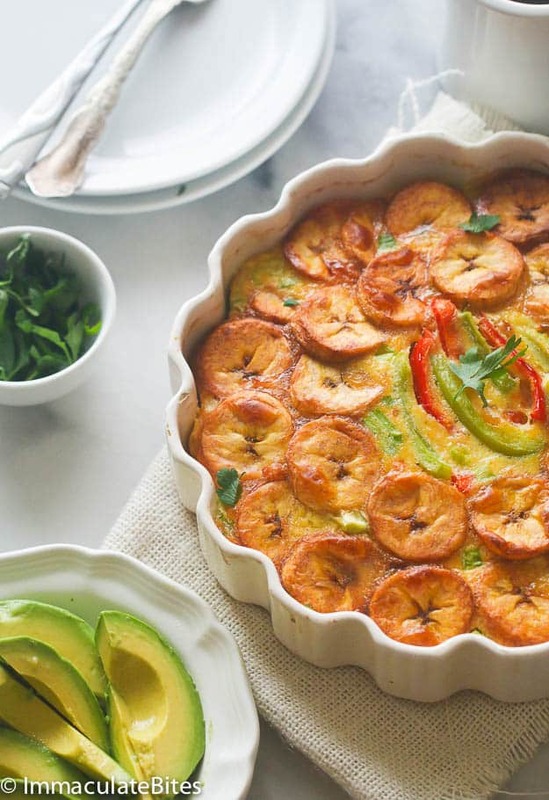 Then look no further, these baked plantains and eggs should be right up your alley. 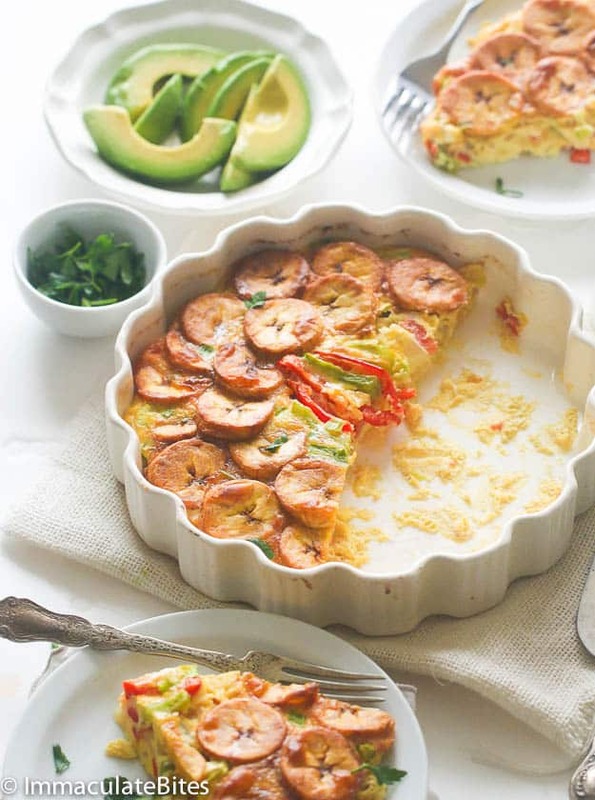 No one will ever guess that this nutritious, mouthwatering breakfast Frittata is lighter! Plantain makes it a hearty, and the eggs and veggies pile on color and wonderful flavor. Fried plantain and egg is one of my favorite weekend breakfast. It is one of the many traditional breakfasts found throughout West Africa .I always look forward to eating it, still do. But the high calories from frying plantains and eggs would always make me sluggish; not getting my motor running in every possible way. 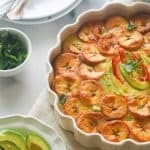 So I came up with a reduce calorie alternative of this popular breakfast; a lighter version of this meal – baked with very little oil and still downright delicious, one that I can indulge in, and not have to worry about hips. 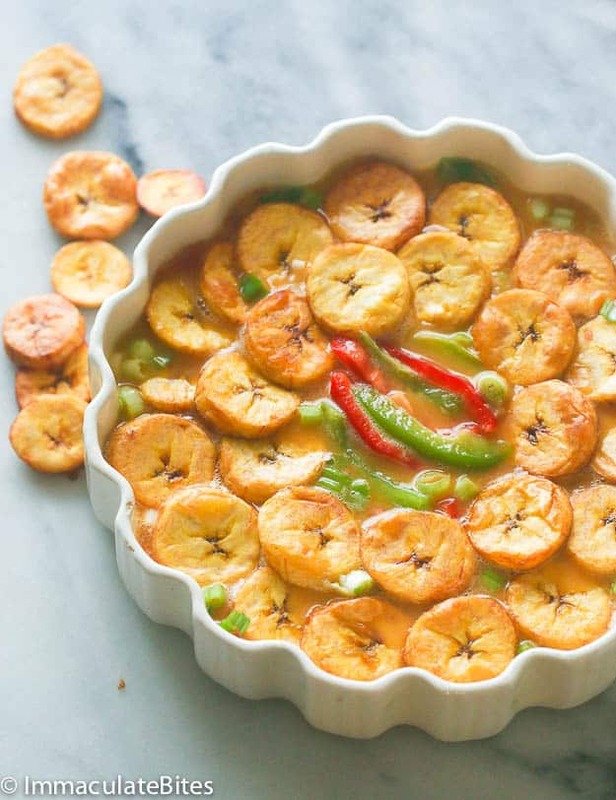 In this recipe, it is best to use ripe plantains, slice and bake them to make the fritta. You may opt to add or reduce the bell pepper or onions. I fried the onions and pepper before adding it to the egg mixture to give it added flavor. Together with garlic, scotch bonnet pepper or hot sauce, smoked paprika , and thyme. You may add other additional spices make to make it more flavorful. Also through in some extra protein like sausage or bacon , if that is your thing. Be careful not to bake the eggs for too long, it might become tough and stringy. Top it with avocado and ketchup. 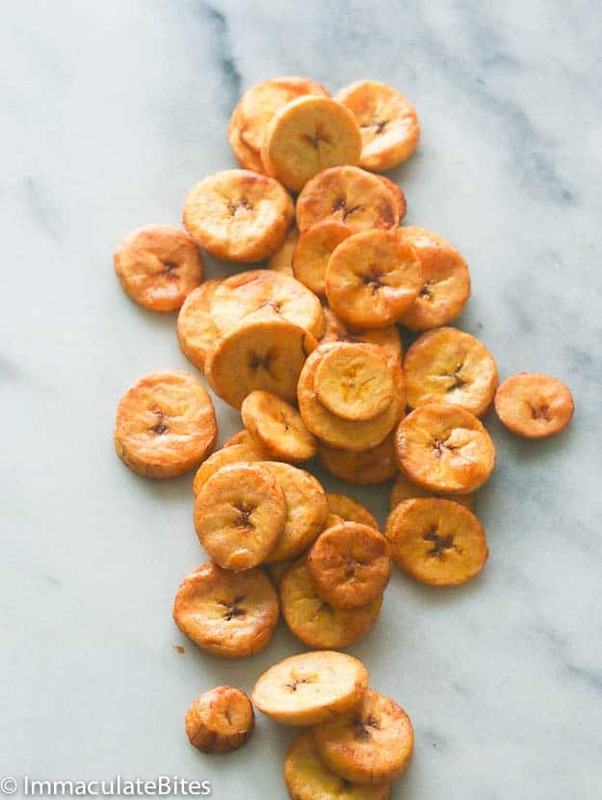 Place them on the baking sheets in a single layer; spray lightly over the plantains using the canola oil spray and bake, turning over slices, after 8 minutes for about 12- 20 minutes or till golden brown, depending on your oven. While the plantains is baking, heat a medium sauce pan over medium high heat and drizzle with 1 Tablespoons of canola oil. Add the onions, tomatoes, green pepper and cook for about 4-5 minutes. In a large bowl whisk eggs, add sauté vegetable mixture, season with salt and pepper according to preference. Pour mixture into a greased 10-inch baking pan. Layer the baked plantains and sprinkle the parsley in the baking pan. Bake in the oven for about 30-40 minutes; until mixture is firm in the center. I watch the video on how to make this recipe. I saw that you added creole seasoning but it is not in the recipe. So it does not specify how much you used. Why is that omitted in the written recipe? l like this. Pls send more. Thanks.And do subscribe so you can have it delivered to your inbox. Thanks! It’s best to fry them- not microwave . Looks delicious. I will be making this tonight. Does it refrigerate well. It’s best the day of . Be sure to use really ripe plantains. Yummy. Thanks Emma. I’ve tried it with potatoes but not plantains. I will try it this weekend. Thanks soooo much for this. I will try it tomorrow. 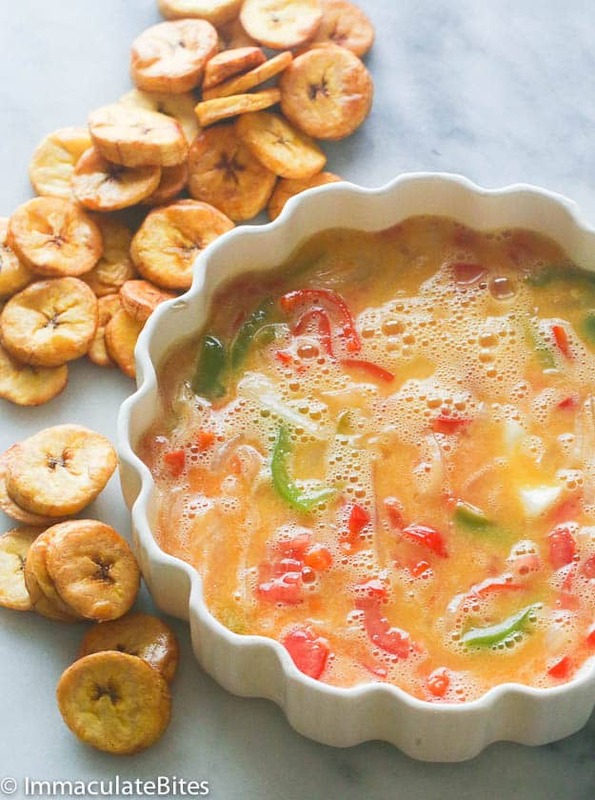 I LOVE fried plantains and lately I’ve been looking for ways to enjoy it without frying. This showed up in my mailbox just in time :-). I am taking off my chef hat and giving it to you. Your recipes are not only pleasing to the eye but soooooo creative and most important tasty. Keep them coming. Yes, you can fry it .